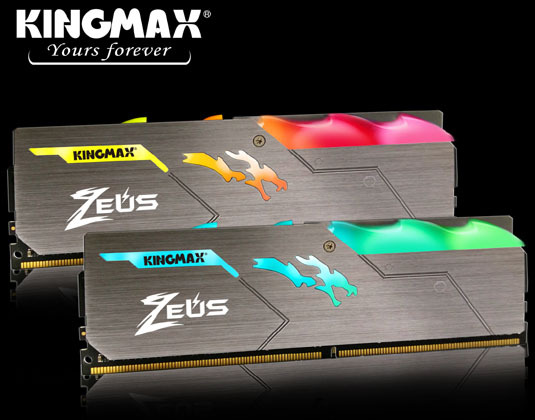 KINGMAX Technology Inc., a world leader in high-performance memory products, today announces the launch of Zeus Dragon DDR4 RGB Gaming Memory Module. Ready for RGB glory, Zeus Dragon DDR4 RGB memory features engaging RGB lighting effects that are compatible with proprietary RGB software from major motherboard vendors including ASUS AURA, MSI Mystic Light, ASRock Polychrome and GIGABYTE RGB Fusion. Zeus Dragon DDR4 RGB RAM features stunning RGB LEDs that deliver bright and vibrant lighting, bringing setups more creative lighting effects that can be synchronized across other RGB devices on activities such as gaming, music, and even CPU/GPU temperature for a more enhanced visual experience. Zeus Dragon DDR4 RGB RAM is built only with selected original IC chips and is 100% factory-tested to assure high stability, durability and compatibility for the current standard. Designed with gaming and overclocking enthusiasts in mind, Zeus Dragon DDR4 RGB RAM comes with high-speed performance and aggressive bii timings. The top offering in the Zeus Dragon series is capable of running at 3466MHz with quick CL-16 timing, making it capable of delivering ultra-fast transfer speeds of up to 27,700 MB/s.